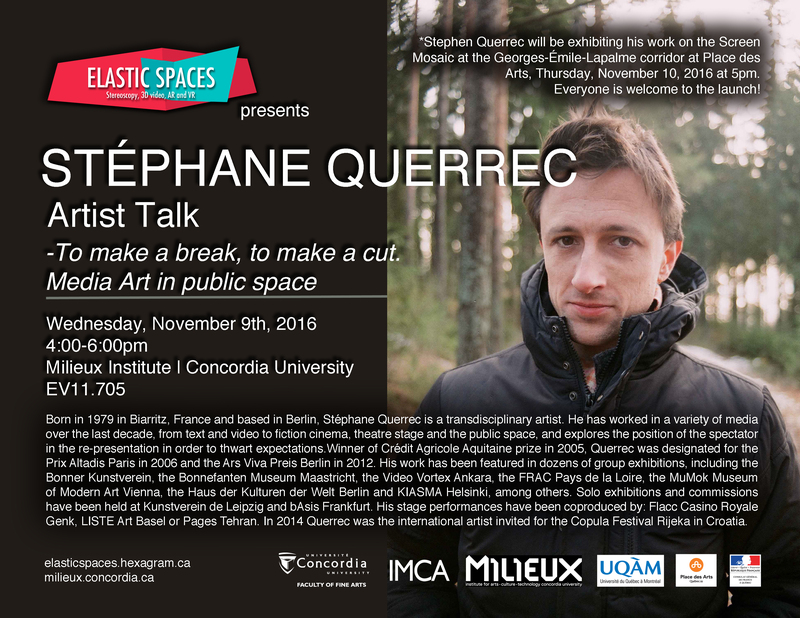 The Elastic Spaces art lab is proud to present Stéphane Querrec, a visiting artist from Berlin who is making a work for the Screen Mosaic at the Georges-Émile-Lapalme corridor at Place des Arts, to be launched Thursday, November 10, 2016 at 5pm. He will talk about his process of working as an artist in the public pedestrian space at the Place des Arts, addressing the challenges, the ethical and technical constraints, and his responsibilities as an artist with this project. This talk will be in English and it’s free and open to the public. This event should be of interest to media artists, researchers and students studying media arts, site specific works, sculptural installation in public spaces and the engagement of viewers in public pedestrian spaces.